As soon as you unpack the last box, you will most probably wonder how to recycle the huge pile of moving boxes. The first thing coming to mind is to throw them away. According to the estimations of the Census Bureau, almost 50 million Americans move every year. Almost all of them purchase moving boxes that are not so easy to recycle after people throw them into the trash. Are there any other ways of dealing with this task? Let’s find out what to do with used moving boxes. In case you bought new boxes for the move, you might want to store them and use during the next move. If that’s your choice, make sure you put the same contents for the same room as you did the previous time, as the boxes will already be labeled. If otherwise, you will have to stick new labels over the old ones. If your new home has enough storage place, you could reuse moving boxes for storing Christmas decorations, out-of-season clothes, extra dishes, sheets, and so on and so forth. You could either ask your friends and neighbors whether they need the boxes or simply give them away on Craiglist or Freecycle. There are tons of people looking for free moving boxes every day. Moving into an apartment complex, ask the manager whether they have a special place for the give-away things. There are lots of organizations that will be happy to accept your boxes. Offer them to libraries, churches or homeless shelters. Living in the US, you can always list your boxes for sale on BoxCycle or any other website like Craiglist, Ebay, etc. you won’t make a fortune here, but will quickly declutter your new home. Talking about what we should do with used moving boxes, let’s not forget about nature. Since it’s not so easy to recycle a cardboard box, flatten and bind them properly, then bring to the nearest recycling unit. Having kids always implies being creative when it comes to toys. 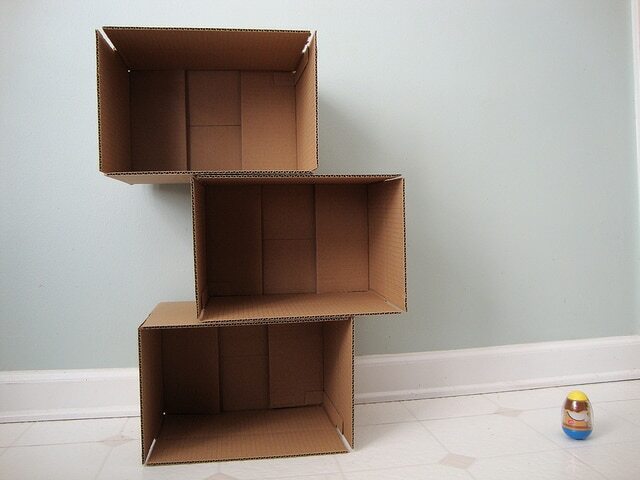 Using a cardboard box, you can make a puppet theater, doll house or garage for your little helpers. Another great idea to reuse moving boxes is to make a costume of a robot. Now you know what to do with used moving boxes after you settled in. ← How Much Do You Need to Live in NYC?